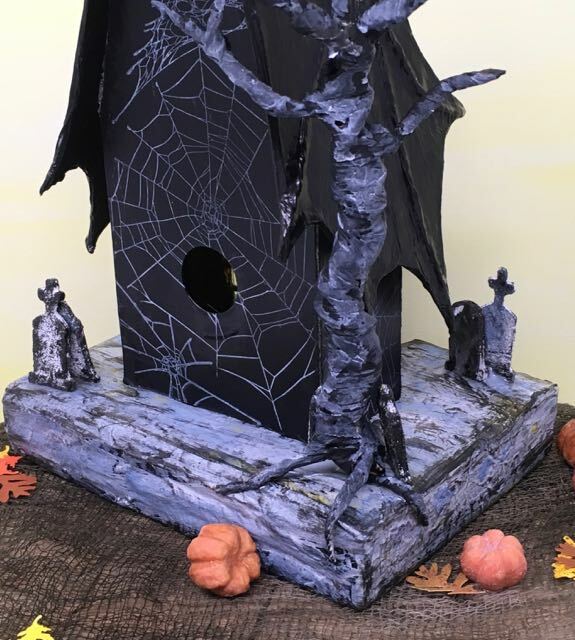 The Count returns this year with a new Bat Wing Halloween House. 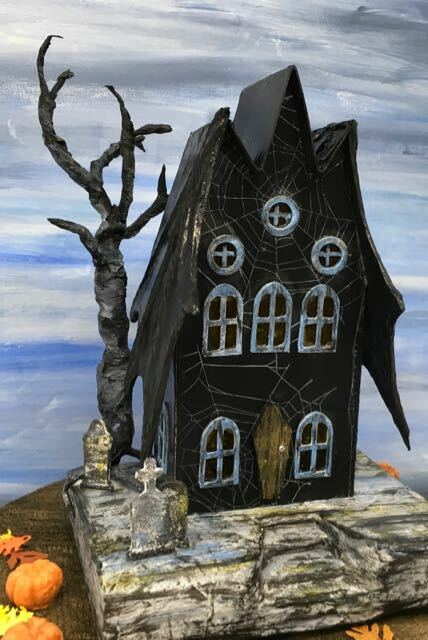 He is delighted with his newly designed haunted house with its coffin-shaped door and the elegant bat wing roof. And he loves the landscaping – gravestones and the twisted tree in the back yard. 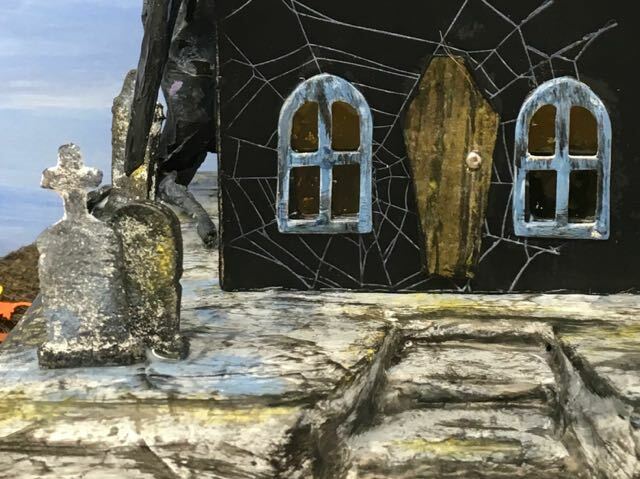 What more could you ask for in a miniature Halloween home? 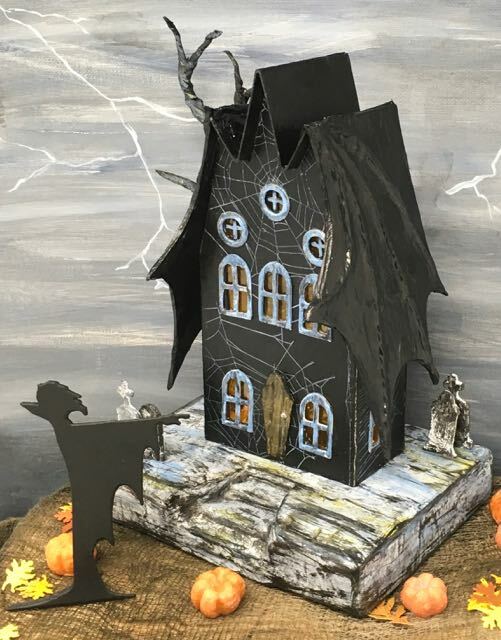 The Count returns to his Bat Wing house on a dark and stormy night, but was he frightened? I don’t think so. One of my readers asked for a pattern for the Bat Wing house so here it is. Overall, the pattern is not difficult. 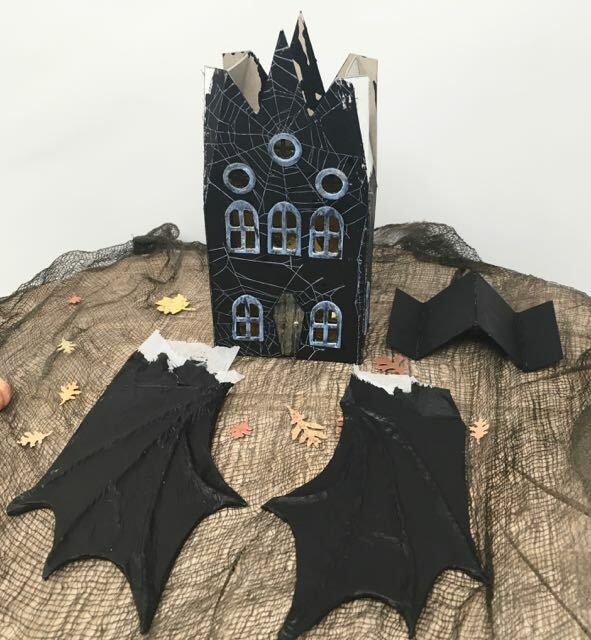 The main challenge is the roofline, but the instructions are detailed to help you make the fun bat wing roof. 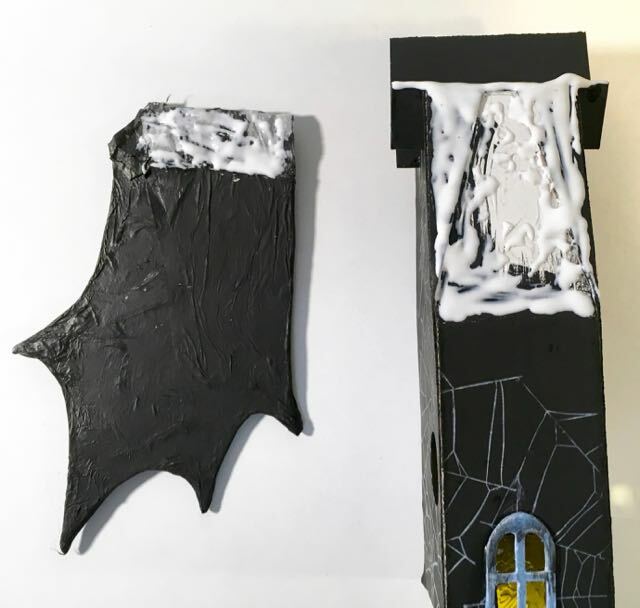 Here are two previous versions of the Bat Wing Houses named “The Count’s Keep” and “The Count Awaits”. Please pardon the photography. Since then, I’ve learned to take better photos. 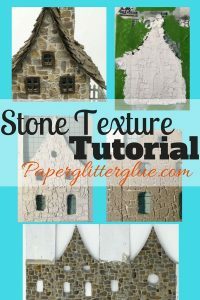 Glue – Aleene’s Fast Grab Glue is my favorite, Quick Dry is good too. 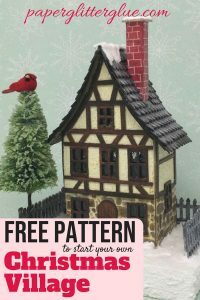 Download the pattern from the Paper Glitter Glue library. Then print on paper or cardstock. Now transfer the pattern to the cardboard. For this, I use transfer paper (used to be called carbon paper). Score the fold lines first, then cut the pattern out. Probably should have just cut out one circular window for the middle gable only. Here’s where I always feel guilty because I don’t cut out windows by hand. I have an arbor press and dies that I use to cut out the windows. You can read about the window technique here. That’s one reason I don’t draw the windows on the patterns – because if you have to cut them by hand, you probably aren’t going to cut out as many windows. For this Bat Wing house I cut 5 main windows on the front and 3 circular windows below each of the gables. On my previous Bat Wing houses, I only had one circular or moon-shaped windows. From a design perspective, I think one window under the tallest gable is the way to go. My favorite is the crescent moon-shaped window. I wish I had remembered that detail for this version of the Count’s house. You don’t need many windows on the sides of the house because of the length of the bat wings. I only put one window on each side. And as always, I include the traditional circular hole in the back because that’s what the old timey, real true Putz houses had to light the houses even though I use LED lights in the base for lighting. 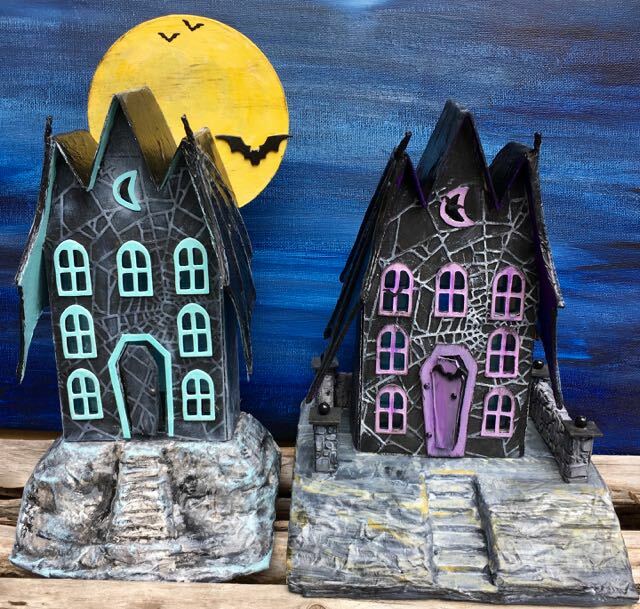 First, decide how you want to decorate the Bat Wing house. To me, a bat wing house has to be black even though bats are not always black. But the bats at the Count’s house are black. Looking at the front of the house, it was kind of boring with this black expanse. Each of the previous versions were embossed with a spider web which was highlighted with white paint. To me it didn’t look the way I wanted it to. 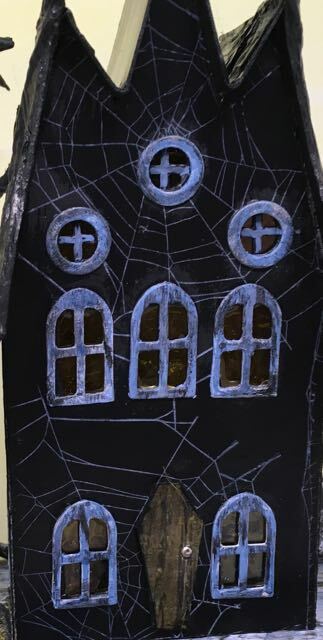 Stampers Anonymous and Tim Holtz came out with this incredibly delicate, detailed spider web stamp set called Tangled Webs. So that’s what I used. It’s a perfect background for the house, not too prominent, but adds a great, subtle detail to the face of the house. Now what to do for the window trim? If the house is black, the trim has to be a light color. The two previous houses had blue and purple windows. Since I try to change things up on each house, I chose a different shade of blue – Faded Jeans distress paint. It works. Just like on the two other bat wing houses, I made a coffin-shaped door. 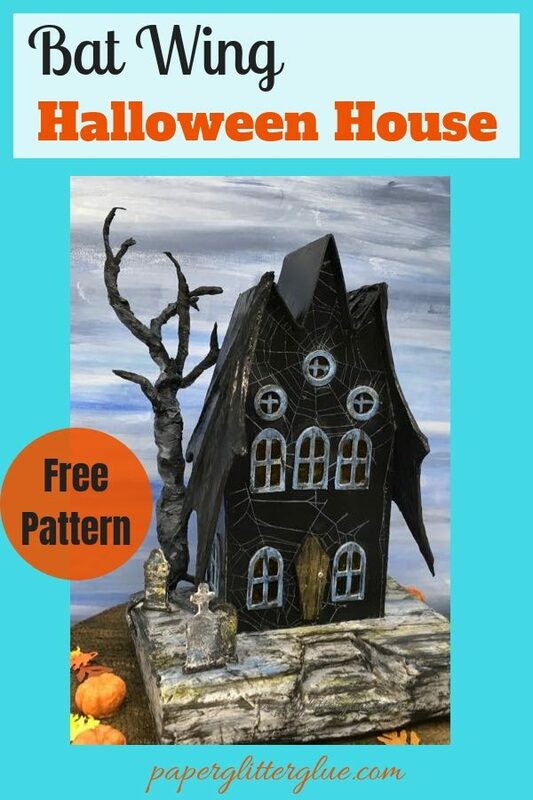 It is a necessity on a house for a spooky Halloween Count. I just cut the door out of paper embossed with a wood grain pattern (Tim Holtz 3-D Texture fade called Lumber) and adhered it to a piece of cardboard to make it stand out a little better. Now for the bat wings. This is the fun part to me. I had to study the structure of a bat wing before I could draw a pattern. It’s kind of interesting because a bat wing is so different from a bird’s wing. What we think of as the wing is mostly the bat’s hand. The thumb is at the top, but I didn’t include it this year because it’s hard to convey that idea. So the 4 points you see on the wing are the fingertips. Cut out the two wings from the pattern. 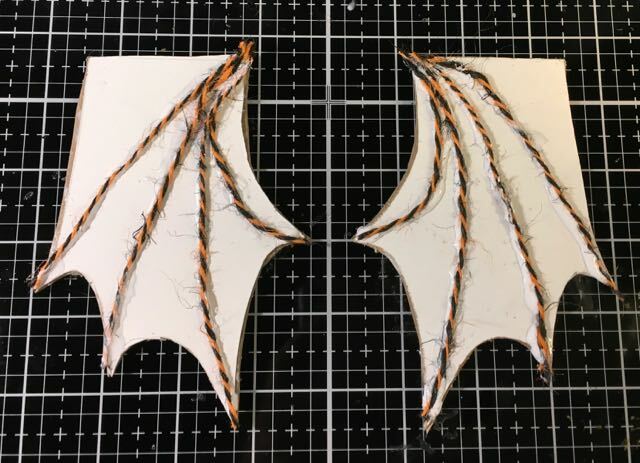 I usually cut out FOUR wings – 2 of each side because the tips of the wings are kind of fragile and I want them to be sturdy and last for many years. If you do that, glue two wings of each side together for a thicker wing. Remember to have 2 different sets of wings. The side with the point that juts out the most is the front of the wing. Last time, I struggled with how to simulate the bones you see through the wing of a bat. I tried wire which was difficult to adhere. Finally I came up with the idea of string because it will stick to a bed of glue and is easy to shape. The other option is hot glue, but I didn’t think of that until today. 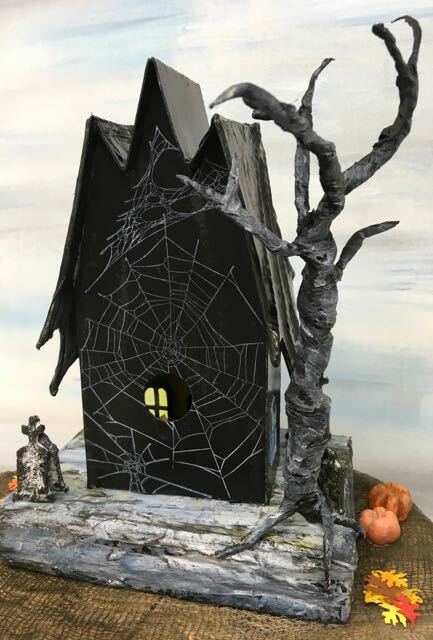 Also the string I used on this house is just a little too thick and hairy, I recommend thinner string like baker’s twine if you have some. I leave extra tissue paper at the top of each wing to fold over the gable so it will adhere better. Fortunately, the tissue paper makes a nice subtle wrinkly effect that works for the a bat’s wing. 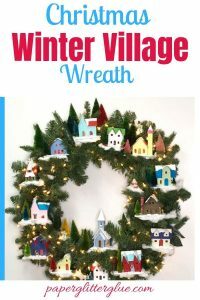 Adhere the tissue paper with a collage medium or a thin glue like Mod Podge so you can ease the tissue paper around the form. If it tears just make a little patch of tissue paper and adhere that. Above the house you can see the W-shaped piece for the roof. It’s the same width as the top of the bat wings. Because black gesso covers things so well, that’s the paint I used here. 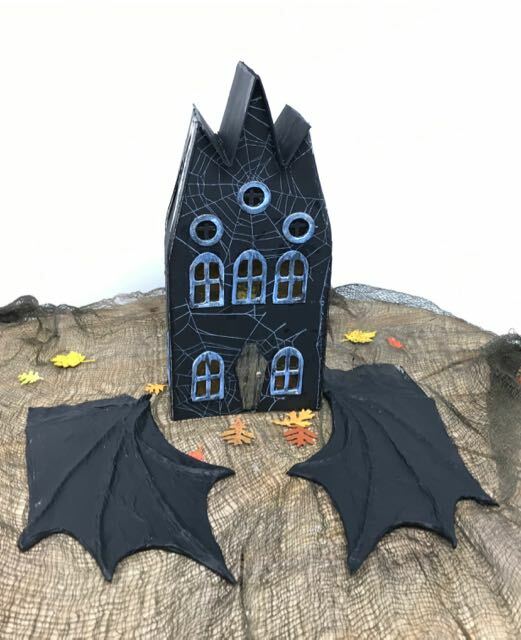 Later I went back and painted all of the tissue paper black on the photo above because it covers the top of the gable where you attach the bat wing. If you are going to make glass for the windows which I like to do, stain some leftover plastic package with yellow marker or yellow alcohol ink. Let dry. Then glue to the inside of the house. I like to smear extra glue over the plastic to make it look like wavy glass. You can see that the windows blur the light a little bit. You will find it easier to glue the windows and the door on while the house is still flat. You can apply better pressure that way without bending the house if it is not already glued together. Since this house fits easily on one 8.5 x 11 inch piece of paper, there is only one glue tab in the back. It’s easy to put together. Then glue the roof flaps on the side gables in place. You can see the W-shaped roof piece best in this photo. Also note the roof flaps attaching to the side gables. This photos shows the W-shaped roof piece in place as well as the roof flaps glued to the roof tabs on the side gables. While the previous step was easy, this one is the only fiddly step. Apply glue to the W-shape of the gables on the house. That means the taller sharp angled gable in the middle and then the inside part of the gable. Just balance a thick bead of glue on the edge of the cardboard. This is the main place that the thick Aleene’s Fast Grab glue is most important. I add a LOT of glue here. After I’ve got the roof holding on, then I mop up the excess with a paper towel or a pen tip covered with a paper towel to get in the crevices. Once again we get to another fun part, because this is where the house takes wing, literally. The thick Aleene’s Fast Grab glue works best here also. Apply the glue to the roof flap of the house. Then spread it around so it’s a thick film but not lumpy like you see in the photo. Also apply glue to the tissue paper flap that will fold over the gable. It’s just a nice extra step to make sure the wing is securely attached. I like the wrinkles as well. Apply a thick glue to the roof flap where the bat wing attaches. Also add glue to the tissue paper at the top to fold over the gable. Where the wing will try to detach itself is at the bottom of the roof flap. To prevent that I just hold it for a few minutes while it sticks. Usually I sing to Bill, the cat, during these gluing interludes when my hands are full. He loves it. If I sing to him, he won’t get in my lap and spread cat hairs into the glue. 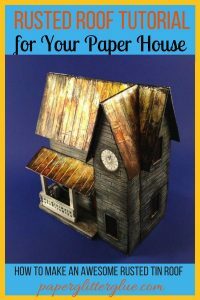 My favorite base for a Putz house or a little cardboard house is the corrugated base covered with newspaper or brown packing paper. You can find these directions for making a base for your little house here. Cut out cardboard base for the Bat Wing House. 2 LED lights fit in the bottom. Also see the cutouts for stairs. LED tea lights are 1.5 inches wide. I usually cut out a space 1.75 inches wide to fit the lights. 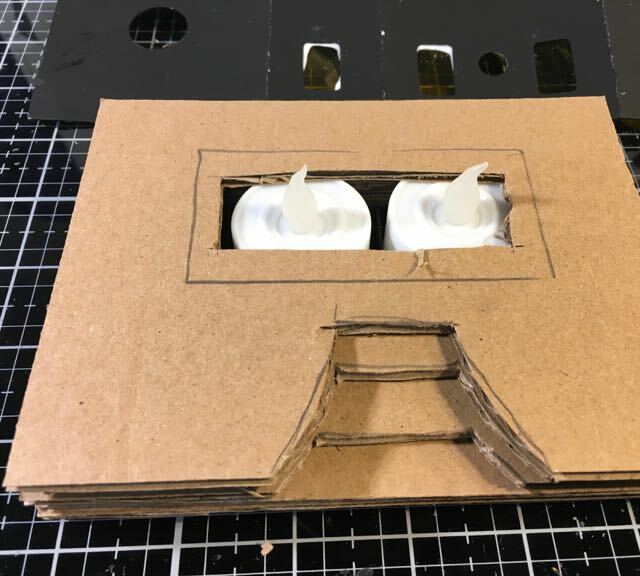 But if the house is 1.5 inches or narrower, I usually make a base with 6 layers of cardboard and a smaller cutout on the top layer so the house will fit nicely on top. 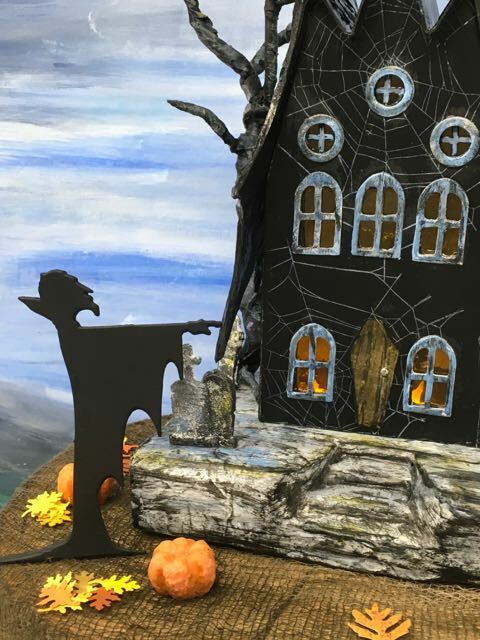 That’s what I did with the Bat Wing Halloween House because it is so narrow. The Count has returned to his Bat Wing abode. He is happy to be home for Halloween. Now for all the people who love to decorate, here is what you have been waiting for – adding embellishments. Because I want the wings to be the focus of the house, I didn’t do elaborate embellishments. But you can. 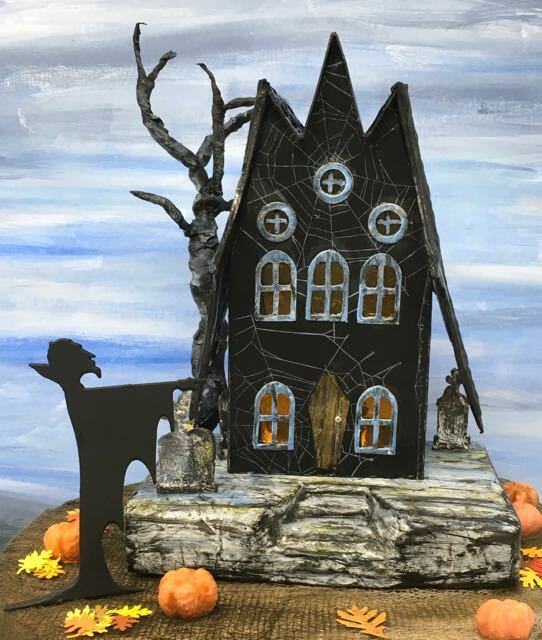 I only added a few Tim Holtz gravestones from the Village Graveyard die and a twisted tree made from wire and paper. You can find the twisted tree tutorial here. The twisted tree fits perfectly on this setting without detracting from the wings. And the Count is from a Tim Holtz die called Ghoulies. There you’ve done it. 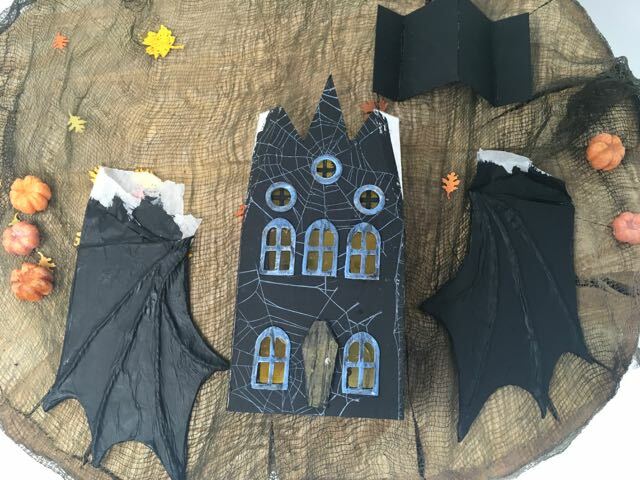 You’ve finished the Bat Wing Halloween House. This time I am very pleased with this pattern – it’s not to big, not too hard to make, and looks really cool. That’s exactly what I want in a Putz house or a little cardboard house. 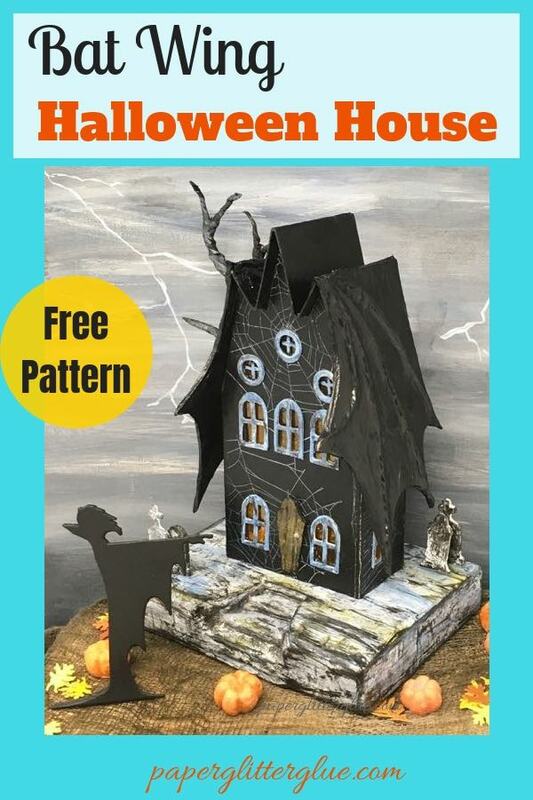 Make your own fun paper Halloween House called the Count Returns. It’s got a cool bat wing roof and a coffin-shaped door. Perfect for any Count.